Too many membership sites are set up in a way that actually increases member drop-outs. How? They make it confusing for prospects to find what they’re looking for; they make the program too long; or they make the program look like too much work. No wonder members quickly become overwhelmed! 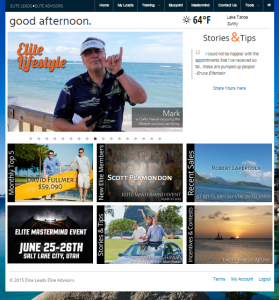 I had the opportunity to work with Ethan Kapp and Brett Kitchen of Safe Money Millionaire, who came to me for feedback about their member site. As it was, their site was much better than most. They put a lot of work into the design to make it look great, and they provided a lot of recognition of successful members. Safe Money Millionaire attracts insurance agents who want to trade their life within an insurance agency cubical for one in which they work for themselves, where they work with prospects by phone. Safe Money Millionaire provides all the training and leads that these agents need to live the life of their dreams for an investment of only $1,500 monthly. While this investment likely seems minimal to successful agents, for new agents who are just getting started, this fee could be thought of as considerable. If they don’t feel like they are going to be successful, they’ll drop out in a flash. Thus, it’s critical to keep agents excited, push them to make their first prospect calls quickly, and help them earn commissions within the program right away. Agents aren’t going to stay members for long if they can’t make the program work for them. 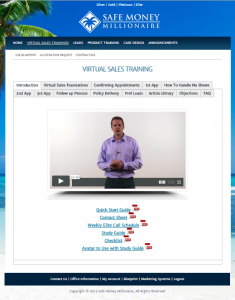 The training section of the site featured comprehensive training resources. Too comprehensive in my opinion. It’s critical to engineer your site to create quick success for your new members. 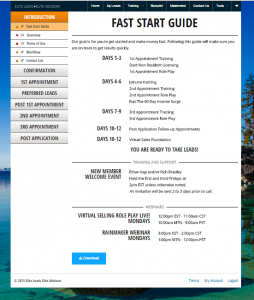 In your effort to be comprehensive, it’s easy to overwhelm these new members. Help them get started by providing them with no more than what they need to take that first step and create success. Provide the comprehensive training later on by giving it when they need it. It’s often helpful to think of your membership program as a video game that allows your members to unlock higher levels as they go and earn special powers when they complete introductory levels. Help your members to implement simple tasks, then give them the tools for more complicated aspects of your program. It’s relatively easy to get a new member. Changing their behavior is what’s difficult. Think of it this way: it’s a lot easier to buy a diet program than it is to change old habits to learn to enjoy eating differently. It’s the same thing with your program. Old habits are hard to break. It takes a lot of effort for your members to learn new skills and to make changes in their lives. What helps them overcome these challenges? Keep your members’ dreams in front of them. Your members will implement your program for the same reasons they joined to begin with. With Safe Money Millionaire, insurance agents who are sick and tired of commuting through traffic to an office, working in a cubical, and hunting for their own leads, can transform their lives. However, to become successful, they will need to learn a few new skills, incorporate some new habits into their lives, and be persistent even if they aren’t immediately successful. The new Safe Money Millionaire site reinforces the opportunity to make that dream a reality each time a member visits the site. Training for new members should be separate from your more advanced resources. Ensure that your new members can find it easily and consider including an orientation for new members within your program. Your orientation should include reselling your members on the dream that encouraged them to take the step to join your program to begin with, giving them a brief tour of what’s available, and showing them exactly what to do to get started. All that, plus include a feedback mechanism. 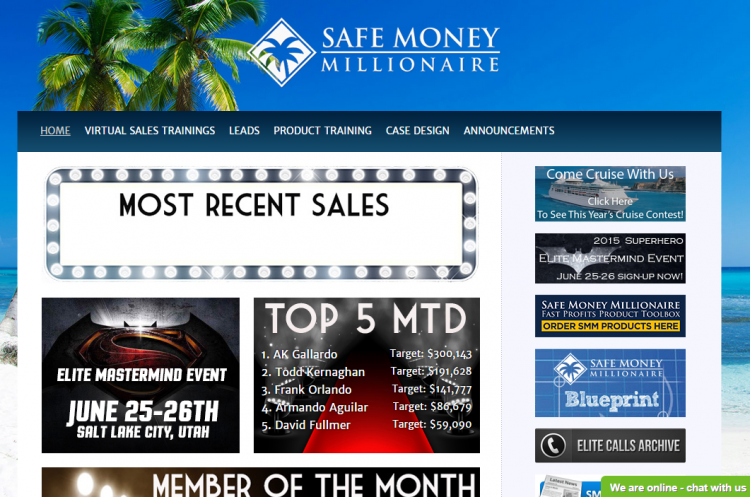 The revised Safe Money Millionaire site tracks member progress. Members can see little red dots next to the modules they haven’t yet completed. As these turn green, the site tracks each member’s progress through training. The moment a new member stops progressing, Ethan and Brett are able to take action to help that member continue his or her progress within the program. This eliminates member churn before it happens by providing help and encouragement exactly when it’s necessary. The transformation generates an immediate return investment. Small reductions in churn rate create large increases in program growth and revenue. That’s the power of these simple changes. Small changes make a huge difference in your lifetime income from your membership program. Is it time to improve your program?